Kidston and Lang (1920a), in their detailed descriptions of plants from the Rhynie chert (see below), noted that they were unable to resolve secondary wall thickenings in the central strand of Rhynia major (now Aglaophyton) (FIG. 7.1). When David S. Edwards (1986) demonstrated that these conducting elements were structurally different from tracheids, he provided the first evidence that Aglaophyton was not a true vascular plant. Additional detailed studies of water-conducting elements in other early land plants (Kenrick and Crane, 1991) indicate a level of structural complexity in these elements, and demonstrate that they are quite different from the tracheids of vascular plants. Kenrick and Crane (1991) delimit three types of water-conducting cells in Early Devonian plants: (1) unornamented, elongate cells, found in the Rhynie chert taxa Aglaophyton major, Nothia aphylla, and the gametophytes Lyonophyton rhyniensis and Kidstonophyton discoides (Edwards, 2003). 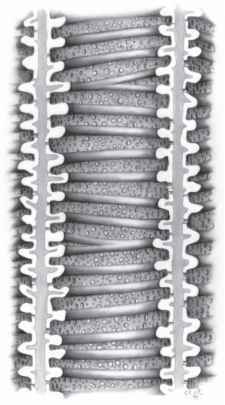 These are comparable in structure to the hydroids of mosses; (2) S-type, and (3) G-type conducting cells. layer. In addition to Sennicaulis , S-type conducting cells are characteristic of various rhyniophytes, including Huvenia kleui, Stockmansella langii, and S. remyi (Fairon-Demaret, 1985, 1986; Kenrick et al., 1991b; Schultka and Hass, 1997). G-type elements were first described in the Early Devonian zosterophyll Gosslingia breconensis (FIGS. 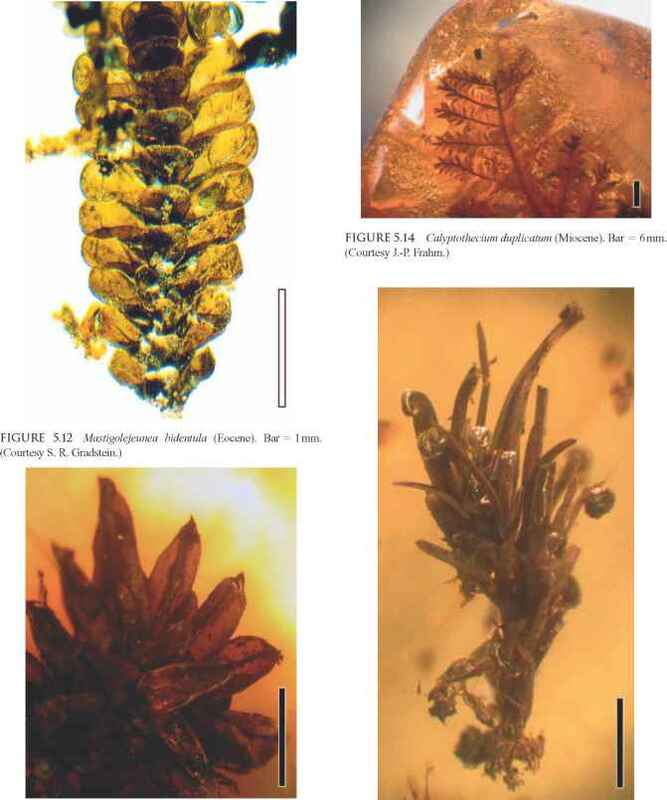 8.2, 8.3) (Kenrick and Edwards, 1988a), but also occur in other zosterophyllo-phytes, Hsua (Li, 1992), Barinophyton (Brauer, 1980), and various early lycophytes (e.g., Asteroxylon, Drepanophycus; Chapter 9) (Berry and Fairon-Demaret, 2001). G-type cells have a two-layered wall. The inner, decay-resistant layer makes up a series of annular thickenings, but also forms a continuous wall area between the thickenings, where it contains small pits. The outer layer is non-resistant and may be mineralized. spiral tracheids, except that the imperforate lateral walls are thicker than the primary wall of protoxylem elements (Edwards, 2003). Indeterminate stomatiferous axes illustrate the I-type. 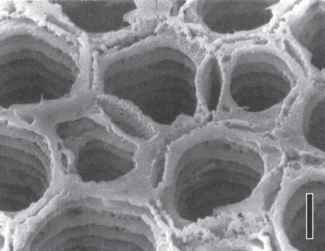 In this bilayered wall, the outer layer is imperforate and fused with that of adjacent cells, whereas the inner layer has rounded perforations. In section, the perforations are slightly wider toward the middle lamella and so superficially resemble bordered pits (Chapter 7) (Edwards and Axe, 2000; Edwards et al., 2003). Such internal wall thickenings may represent structural features of the cells which help to reduce embolism in early homoiohydric plants. This hypothesis is supported by the presence of G-type cells in the main axes of Sawdonia ornata from Roragen, Norway, but not in the laterals (Edwards et al., 2006b). The spongy organization of the wall may represent the template where lignin was deposited once this biochemical pathway evolved. It is not known whether the central strand cells in many early plants contained sufficient amounts of lignin to be useful in support. The small size of the central strand compared to the diameter of the stem, however, is more consistent with the hypothesis that turgor pressure in parenchyma cells was the primary means of maintaining rigidity in these early land plants (Speck and Vogellehner, 1988). Although some authors call these cells "tracheids," we have chosen to use the term conducting cells, since their homologies with either true tracheids or bryophyte hydroids remain uncertain. These cell types do, however, provide a functional perspective that can be used to test hypotheses about water conduction in early terrestrial ecosystems (Edwards et al., 1998b; Cook and Friedman, 1998; Friedman and Cook, 2000) (FIG. 8.5t. What are the conducting elements in plants?